Huangshan City has a history of over 2200 years dating from Qin Dynasty (221-206 BC). The city was once a cradle of splendid cultures and great charming. 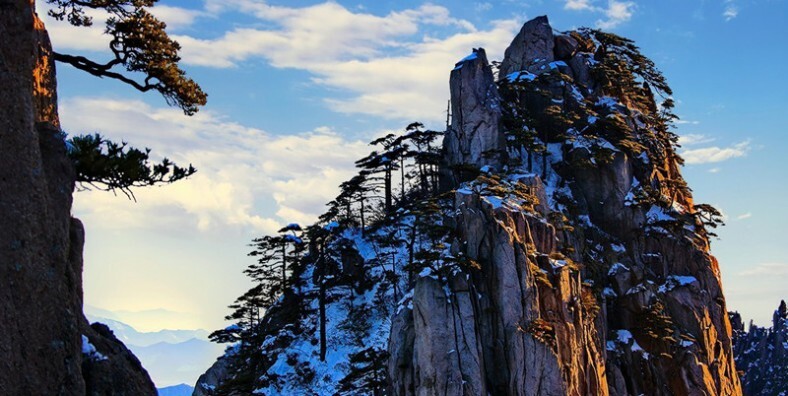 Huangshan(Yellow Mountain) is one of the most famous and beautiful mountainous areas in China, located in the eastern province of Anhui, ranks among the Great Wall and the famous Terracotta Warriors as one of China’s most charming tourist attraction. Huangshan Scenic Area:The Yellow Mountains was listed as a World Heritage Site by UNESCO in 1990. Its marvelous natural view includes oddly-shaped pines and rocks, and amazing cloud seas. Xidi village: The history of Xidi Ancient Village was can be traced back to the 11th Century, decorated with a lot of wood carvings, stone carvings and tile carvings, which would lead you to enjoy the culture of Ming and Qing dynasties. Xin An River: The river is a tributary of the Qiantang River. Many scenic spots scatter along the beautiful river, such as White Sand Bridge (Baishaqiao), Red Pond (Zhuchi), Phoenix Alighting Hill (Luofengshan), Plum City (Meicheng) and Double Pagodas Piercing Clouds (Shuangtalingyun). Tunxi Ancient Street: Old Street, old shops, old architecture and and amazing Chinese food restaurants, make Tunxi Old Street one of the region’s favorite tourist spots. Hongcun Village: The ancient small village has la history of more than 800 year. Its deep culture, traditional country scenery, and well-preserved old buildings lead it into the World Heritage List.